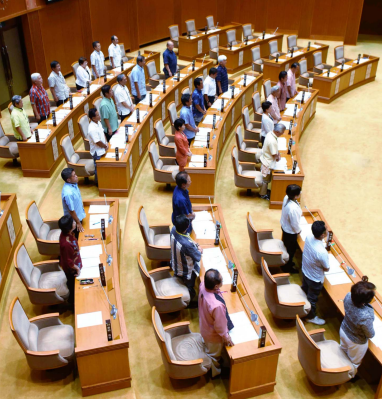 On the morning of May 17, the Prefectural Assembly adopted a resolution of protest in regards to the recent incident of the body of a woman being dumped by a U.S. base employee. At an extraordinary session of the Okinawa Prefectural Assembly opened on May 26, both the ruling party in the Assembly and those belonging to other parties unanimously agreed on a resolution of protest and a written argument against the recent incident of a woman’s body being dumped by a military base employee. The resolution and argument demand an apology and full reparations to the bereaved family of the woman, abandonment of the plan to build a relocation facility for Futenma Air Station in Henoko, and withdrawal of the U.S. Marine Corps from Okinawa. This is the first time the Prefectural Assembly has made a resolution demanding the withdrawal of the Marine Corps. LDP members as well as Hikaru Minei (independent) and Hiroshi Goya (independent) did not participate in the vote on the resolution and argument. Part of the written argument states that the base employee’s brutal act makes light of Okinawan citizens’ lives, and such acts absolutely cannot be permitted. The argument also calls for (1) an apology and full reparations to the bereaved family, (2) negotiations with Japanese and American heads of state concerning countermeasures to military base issues, accidents and incidents, (3) abandonment of relocation of Futenma Air Station within Okinawa, (4) withdrawal of the U.S. Marines from Okinawa and substantial reduction of bases, (5) drastic revision of the U.S.-Japan Status of Forces Agreement, (6) and a temporary suspension be enforced on access to civilian areas by training drills, military personnel, and military vehicles when a violent incident occurs. The written argument is addressed to Japan’s prime minister, foreign minister, minister of defense, and minister in charge of Okinawan affairs. It is also addressed to the U.S. ambassador to Japan, the commander of the U.S. Forces Japan, the Okinawa area coordinator, and the U.S. consul general in Okinawa. Minei and the LDP members who left their seats at the vote had requested some changes to the wording of the written argument. They had asked for “abandonment of relocation of Futenma Air Station” to be changed to “the closure and return of Futenma Air Station,” and “withdrawal of the U.S. Marines from Okinawa,” to “aiming for substantial reduction and speedy adjustment and reduction of U.S. bases.” These members submitted a revised version of the proposal containing the aforementioned changes. The revision also demanded an end to incidents, an apology to the bereaved family, and compensation from the Japanese and U.S. governments. However, only a minority voted for the revised version, and it was rejected. Members of Komeito voted in favor of both versions of the written argument. Before making the resolution, all members assembled at the session offered a moment of silence for the victim of this recent incident.